Yoga is a spiritual discipline which includes breath control, meditation and the adoption of specific postures. 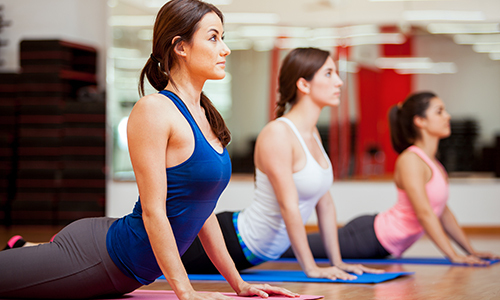 Yoga classes at our Ealing Gym can aid general health and relaxation. Yoga is about creating balance in your body and mind, while developing both your strength and flexibility. It is an excellent form of exercise for people of all ages, shapes and sizes and can help to improve your overall health over time. Encourages positive thoughts and self-acceptance. Develops the relationship between your mind, body and soul, helping you be at one with yourself. There are several forms of Yoga available in our Fitness & Wellbeing gyms, including Hatha, Vinyasa and Ashtanga Yoga. Hatha Yoga is slow-paced and gentle, focussing on breathing and meditation. It acts as a great introduction to more advanced styles of yoga and often there is no flow between poses. You can expect to be introduced to some basic breathing exercises and also some seated meditation. Perfect for beginners and people wanting to learn the core basics. Vinyasa Yoga covers basic poses and breath-synchronized movement focussing on inhaling and exhaling. Vinyasa has both mental and physical benefits. Expect to expel toxins and re-energize your body. Mentally, the synchronized breathing relaxes your mind and helps to release any blockage of energy flow throughout your body. Perfect for beginners and advanced participants alike seeking to strengthen their bodies. Ashtanga Yoga is considered a form of power yoga. It is fast-paced and intense in comparison to Hatha and Vinyasa with lunges and push-ups. Perfect for fit people looking to maintain their strength and stamina, as well as those who want to get in touch with their spiritual side. Yoga involves a lot of stretching and movement, so we suggest you wear something comfortable to enable you to flow from one pose to another. You are also likely to work up a sweat during the class, so wear something breathable. You don't need to bring a Yoga mat (unless you want to bring your own) as we can provide one.